Airline Flybe has today announced that it has teamed up with Disneyland Paris in a move that will pave the way for exciting promotions and added incentives for Flybe passengers to include flights, accommodation and theme park ticket packages. 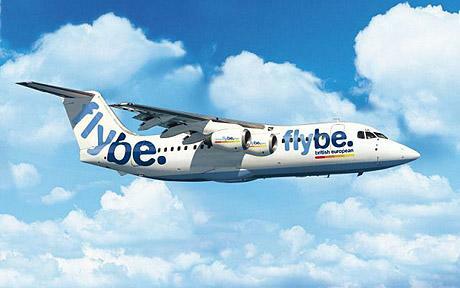 The deal builds on two successful campaigns that Flybe has previously run with Europe’s leading tourist destination. Recent offers have seen Disneyland Paris give a complimentary Adult Entry Ticket for the Resort with every Flybe flight booked and an exclusive deal for all customers booking Family Breaks through the airline. Flybe offers 150 flights a week to and from Paris Charles de Gaulle airport from eight UK airports, namely Belfast City, Birmingham, Cardiff, Exeter, Glasgow, Jersey, Manchester and Southampton with fares from £29.99 one way including taxes and airport charges. Lee Unkrichis personally auctioning a bunch of rare/exclusive Pixar memorabilia to benefit Haiti earthquake victims. 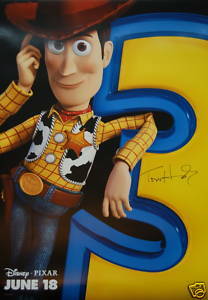 Tom Hanks signed Toy Story 3 Woody poster. Lee’s personal 2001 Original Monsters, Inc. Crew Jacket. Four-pack of custom Jones Soda, given as a gift to the Monsters, Inc. crew by director Pete Docter. Pixar MOMA Catalog signed by 22 artsists. Its a good cause, and some items you’re not likely to find anywhere else. Lee will probably be posting more items in the coming days, keep checking his ebay account listings for updates. The world’s top computer gamers will be in Disneyland Paris from 30 June to 4 July 2010 to take part in the 7th Electronic Sports Wold Cup 2010 Grand Final (ESWC 2010) . Disneyland Paris will host the video games event which will be held in the Disney Village. The events 600 competitors will be staying at the numerous hotels of the resort. The event sponsored by Peugeot will feature a total prize pool of $200,000. Disneyland Paris to celebrate 100 years of Girl Guides. After the gates close to the public on Saturday 23 January Disneyland Paris will remain open exclusively for 5,000 Brownies and Guide groups from around Europe. Brownies and Guide groups from all around Europe will gather to celebrate 100 years of Girl Guides, and renew their promise under the castle and experience an amazing firework display to help celebrate the centenary of the Girl Guides organisation. Disney quietly working on $1 billion-plus “next generation” technology project. The Walt Disney Co.’s theme-park division is quietly working on a major technology initiative that boosters hope could radically transform the theme-park experience. Details of the project, which has been dubbed within Walt Disney Parks and Resorts as “next generation experience” or “NextGen,” are being closely guarded. But there is widespread speculation among former Disney executives and bloggers who follow the company that at least part of the project involves wireless-communication technology that could be used in concepts ranging from keyless hotel-room doors to rides and shows in which the experience varies based on an individual guest’s preferences. The budget for the program totals between $1 billion and $1.5 billion, according to former Disney parks executives who spoke only on the condition that they not be identified. The amount is roughly comparable to what Disney is spending to build a pair of 4,000-passenger cruise ships. Just before Christmas, Disney assigned oversight of the project to Nick Franklin, the head of global business and real-estate development for the company’s theme-park unit. Franklin’s newest title is “executive vice president of next generation experience.” At Walt Disney World, the project is being led by Jim MacPhee, a vice president who once ran the Epcot theme park. MacPhee’s title was changed last month to vice president of park operations and next generation experience. Disney would not discuss specifics of the project. “Our company has a long history of leveraging technology to enhance the experience of our guests, and we are constantly exploring new opportunities to build on that legacy,” spokeswoman Tasia Filippatos said. Though Disney typically keeps a tight lid on projects in development, the strict silence surrounding the NextGen initiative has surprised some company veterans. Disney has required employees assigned to the project — “several dozen” people are currently working on it, according to one of the former executives — to sign confidentiality agreements forbidding them from discussing their work, even with colleagues. One former Disney manager described the climate surrounding the project as “super quiet.” Yet another likened the hush-hush atmosphere to the silence that surrounded the development of Disney’s Magical Express, the airport shuttle-and-luggage service introduced in Orlando in 2005. Several other people in and around Disney said they are aware of the NextGen initiative. But all said they were either unfamiliar with details or that they could not discuss them. The secrecy, of course, hasn’t stopped speculation. Though the “NextGen” work has multiple components, several Disney bloggers, including Crawford, have reported that a key part involves the development of radio-frequency identification microchips that could be implanted into park passes or wrist bands. Guests would supply personal information ahead of their arrival — from their names and credit-card numbers to their favorite Disney characters — that would be downloaded onto the RFID microchips, which would then interact with sensors deployed throughout Disney’s resorts. Disney has discussed the technology with Precision Dynamics Corp., a San Fernando, Calif.-based company that manufactures RFID wristbands. A representative for the company said he could not elaborate on those talks because Precision Dynamics has signed a non-disclosure agreement with Disney. RFID technology has “certainly been on Disney’s radar as well as the other major [tourism] players in the Orlando area,” said Tom Foster, sales manager for Precision Dynamics’ RFID solutions group. Crawford said he has been told that Disney’s work includes what is being called a “personal experience portal,” which he thinks could be the online site that guests would use to provide personal details and preferences. The blogger noted that posts he has written in recent months on Disney’s RFID efforts have attracted unusually heavy Internet traffic from IP addresses associated with Disney offices in Orlando and California. RFID technology is already used in many areas of everyday life, from the contact-information chips that pet owners have implanted in their dogs and cats to the bracelets that hospitals use to track patients and their treatments. The technology is spreading through the amusement industry, too. Indoor-waterpark operator Great Wolf Resorts now uses RFID wristbands manufactured by Precision Dynamics at seven of its 12 resorts in the U.S. and Canada. The wristbands function both as hotel-room keys and personal charge cards for guests, allowing them to buy food and souvenirs without carrying a credit card or cash. Though Disney is also interested in both keyless hotel entry and cashless transactions, its full RFID plans are said to be more ambitious. Former employees and bloggers say Disney is looking at using RFID sensors in attractions, so that experiences could be tailored based on individual guest preferences. For example, as guests wander around a park or advance through a ride, their favorite animated character might appear and address them by name. Another goal, according to the former Disney managers, is to greatly reduce or eliminate lengthy wait times at popular attractions — waits that can top three hours on particularly busy days and which a current Disney World executive said are routinely cited as a “key negative” by guests who visit the resort. One possibility is to allow guests to select preferred ride and show times and then use RFID scanners at attraction entrances to verify that they are showing up at the correct time. RIFD tracking could also give Disney much more detailed data about its guests’ spending habits and movements, which could in turn be a powerful sales tool. Disney might be able to tell, for instance, that a family wandering one of its theme parks in the evening has no dinner reservations, and so could contact the family by cell phone to suggest nearby restaurants with available seats or promotions. “The back story of this is they’re going to be able to track everything you’re doing,” said Al Lutz, editor of MiceAge.com and someone who also has written about Disney’s RFID development efforts. The project isn’t without risks. Some former employees have expressed skepticism about whether the technological advances would do enough to boost attendance or guest spending at Disney’s theme parks to justify the $1 billion-plus price tag — or whether such money would be better spent on projects such as new resorts or attractions. Disney also faces questions about whether guests would want to put so much thought into planning their vacations — and how such advance planning by some guests might affect others who could conceivably miss out on a popular attraction because time slots have been reserved ahead of time by those who planned. Even eliminating attraction lines could be tricky: A theme park could actually feel more crowded if a certain percentage of people were no longer spending time waiting in ride queues. The Walt Disney Company announced on Wednesday that it will contribute $100,000 in humanitarian aid to the victims of the earthquake in Haiti. The donation will be provided to the Red Cross International Fund to support Haiti’s relief efforts. In 1918 Walt Disney joined the Red Cross when he was 16 years old and was sent to France, where he spent a year driving an ambulance and chauffeuring Red Cross officials. His ambulance was covered from stem to stem, not with stock camouflage, but with drawings and cartoons. To Donate to the Disasters Emergency Committee (DEC) Haiti Earthquake Appeal click here. Here is a sneek preview of the New Generation Festival video trailer for Disneyland Paris.